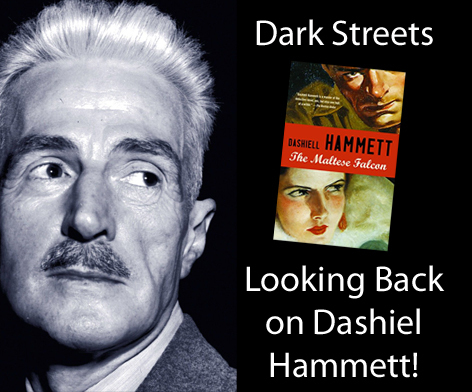 Hammett was not only an author of hard-boiled detective novels, but he also penned many short stories and was even a screenwriter. Among his memorable characters are Sam Spade (the Maltese Falcon) and two characters very near and dear to my own heart, Nick and Nora Charles (The Thin Man). In the Maltese Falcon, Sam Spade is a private detective in partnership with Miles Archer. A beautiful young woman, "Miss Wonderly", hires them to follow Floyd Thursby, and find her sister, who ran off with him. Archer takes the first stint. That night, Archer is found shot to death. A few hours later, Thursby is also killed and Spade is a suspect. "Miss Wonderly" is soon revealed to be an acquisitive adventuress named Brigid O'Shaughnessy, involved with the title object, a foot-high black statuette of unknown but substantial value. Others are after the falcon, including Joel Cairo, and Casper Gutman. The statue, of a “maltese falcon” is worth a great deal of money. Spade ends up partnering with Gutman and Cairo and then they find out that the falcon is a fake, a decoy. Gutman decides to go after the real falcon and Cairo joins him. In the meantime Spade discovers Brigid has lied to him and double crossed him and gets her to admit that she killed Archer. Spade, at the end of the story, turns her in. The 1941 film version starring Humphrey Bogart is perhaps the best known out of the three made. Many people think that “The Thin Man” refers to the story’s detective, Nick Charles, when in fact it actually refers to the victim. Hammett created the characters of Nick and Nora Charles, a married couple who solve murder mysteries while exchanging sharp and smart repartee, in his novel The Thin Man in 1934. The film version closely follows that of the book. Dorothy Wynant visits her father, inventor Clyde Wynant, to announce her impending marriage. When her father opens his safe to get her some stock certificates as a wedding gift he realizes that his mistress, Julia Wolf, has stolen them. Shortly afterward Clyde vanishes and Julia turns up dead. Dorothy approaches Nick Charles to investigate the disappearance. Seems Nick is semi-retired, having married the wealthy Nora, and spends his days managing her vast holdings. He cannot resist the lure of the chase, though, and Nora, who is a mystery lover, convinces her husband to take on the case, which she proceeds to help him with along with their dog, Asta. When two other men are killed and Clyde is accused of murder, Nick invites all the suspects to a dinner party where he discloses the killer, motive and means ala Murder on the Orient Express style! So taken was I with not only the book, but the five “Thin Man” films made starring Bill Powell and Myrna Loy, that I wrote my own cozy mystery series paying homage to the characters. (Although in my series, Nora Charles is an ex-true crime reporter and Nick is her furry sidekick). Hammet’s work stands the test of time. Not only are his characters unforgettable but they are considered true hallmarks of detective fiction. If you like your detectives on the rough and ready side, then this is for you! Check it out you will not be disappointed!